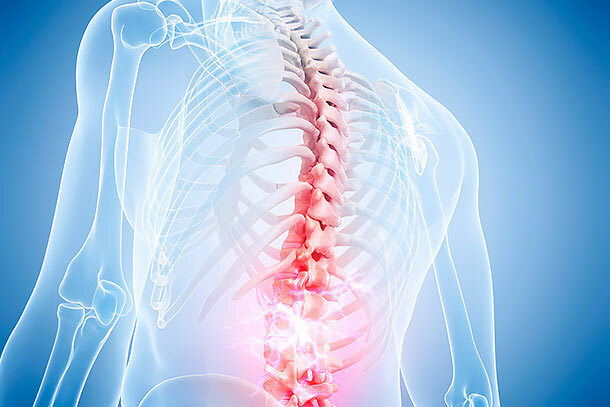 Physicians at the Spine and Neurosurgery Program at Centennial Hills Hospital Medical Center use non-surgical and surgical therapies to help treat neurological and spinal disorders, and help people live an active life. Physicians will evaluate your condition and recommend a treatment program that could include physical or occupational rehabilitation, exercise or other therapies to relieve pain and help increase function. If surgery is required, many procedures can be performed using minimally invasive techniques, which may result in a shorter hospital stay and a quicker recovery time. Among the most frequent conditions we treat are: lumbar spinal stenosis, stroke and brain tumor. Our specialized services include include minimally invasive spinal surgery, skull base surgery and outpatient therapy and rehabilitation. Learn more about each below. When operating on the spine, many procedures can be done with minimally invasive techniques, in which the surgeon makes small incisions in the spine area, and uses small cameras designed for viewing internal portions of the body. The most common abnormality that would require skull base surgery is a brain tumor, often benign. Skull base tumors are not a particular type, but lie in a particular location: near the bones of the skull that form the bottom of the head and the ridge behind the eyes and nose. Another common problem that may require skull base surgery is an aneurysm, a localized enlargement of an artery caused by weakness in the arterial wall. Alternatives to surgery include chemotherapy, embolization and radiation. When these are not effective, surgery may be needed. Doctors are unsure of what causes skull base tumors. In rare cases, they have been linked to radiation exposure or genetic factors. The cause of aneurysms at the base of the skull also is largely unknown; however, a small percentage are inherited defects. Cigarette smoking and high blood pressure can cause aneurysms to grow and bleed. Surgeons at Centennial Hill Hospital Medical Center take care to minimize the size of a bone opening during skull base surgery so that recovery may be faster. Refinements in skull base surgery techniques now allow Centennial Hill Hospital neurosurgeons to treat brain tumors that were previously thought to be inoperable. If you need a referral to a spine specialist or neurosurgeon who practices at Centennial Hills Hospital Medical Center, contact our free Doctors Plus referral program at 702-388-4888.